In its biggest case involving abortion rights in more than two decades, the Supreme Court overturned key parts of Texas House Bill 2 (HB2) on Monday. Specifically, the highest court in the land ruled that two of HB2's provisions — that all abortion clinics meet the same standards as hospital-style surgical centers, and that all doctors who perform abortions have admitting privileges at nearby hospitals — were unconstitutional. While the Supreme Court struck down these restrictions in Texas, many other states currently have similar Targeted Regulation of Abortion Providers (TRAP) laws, which place stipulations on clinics and doctors who perform abortions to the point where they're unable to operate. What will happen to TRAP laws in other states now? We conclude that neither of these provisions offers medical benefits sufficient to justify the burdens upon access that each imposes. Each places a substantial obstacle in the path of women seeking a previability abortion, each constitutes an undue burden on abortion access, and each violates the Federal Constitution. As the 2016 documentary TRAPPED shows, these types of laws have a crippling effect on women seeking abortion far beyond Texas. The Sundance Film Festival winner of the Special Jury Award for Social Impact Filmmaking captures the obstacles that clinics across the South face just to remain open. I reached out to TRAPPED director Dawn Porter after the Whole Women's Health ruling to find out what impact it will have on other TRAP laws throughout the country. "Today is huge," Porter tells me. She says she's optimistic about the national influence the decision will have. "That was always the big question — whether the ruling would be broad enough so that other states would be protected." Considering the 5-3 vote, and how both questionable provisions of HB2 were struck down, Porter believes the Supreme Court was "quite unequivocal that [the HB2 stipulations] were a sham and won't protect women." As a result, the ruling "could have a wide-ranging effect." "This is exactly what we hoped for," she says. "The court was clear that if a law closes clinics and has no health benefits for women, it's an undue burden." 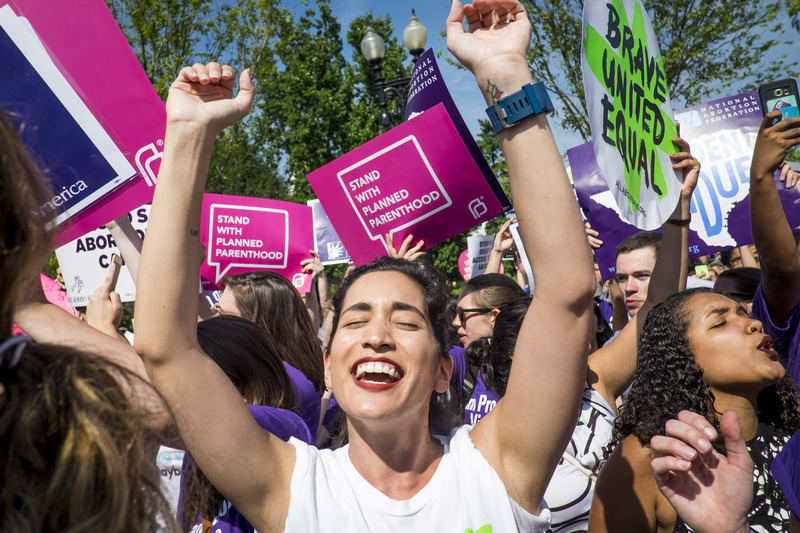 Even though the ruling won't block or overturn existing TRAP laws, Porter believes that "the clear message to states is 'Don't try to be tricky [by passing abortion restrictions] cloaked under the guise of protecting women.'" Specifically, she thinks that many states will now hesitate to pass new TRAP laws, at least as they relate to admitting privileges for doctors and hospital standards, because they've seen how unsuccessful they were in Texas — and how costly that was for the state. "I think for state governments with budgetary pressures, spending money on litigation is very hard to justify when your citizens don't have good healthcare or good roads. It's the state taxpayers who are paying these legal bills, and it's really hard to justify," Porter says. "I think the other message that's going through is that the clinics are well represented and aren't going to back down from a fight." The fight certainly isn't over for pro-choice activists. A number of politicians have made it clear how disappointed they are in the Supreme Court ruling, and have vowed to "protect TX women from an abortion industry that prioritizes profits over safety," as Sen. Ted Cruz tweeted. Still, Porter is celebrating Monday's ruling: "It's great news for democracy," because it shows that you "can't take aim at a constitutional right under a pretext."